Setting up your own coffee shop or café will be the most exciting thing you have ever done. However it is not just about finding what you believe to be a good location, getting a coffee machine onto a counter you have built with your DIY skills, and going for it! 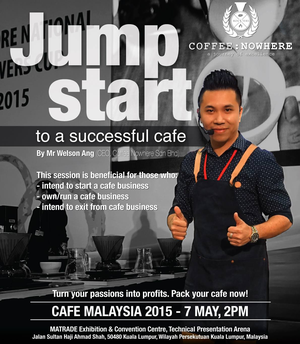 Speaker Welson Ang, CEO, Coffee Nowhere, will be sharing his secrets and strategies how he started a coffee business with "zero knowledge" to the rapid business expansion across different countries in just months! Turn your passions into profits. Pack your cafe now!